Alialujah Choir came about when three well-known members of Portland’s notable music scene took time away from the comforts and constraints of their primary bands (Weinland, Norfolk & Western, M.Ward) to focus on the natural beauty they found when singing songs from their more personal artistic quivers. The songs immerse the singers as their voices entwine with one another and then expand. 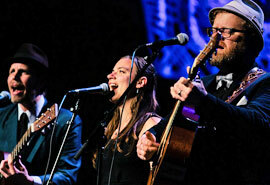 Sparse arrangements create an open bed for two, three, and four part vocal harmony, while instrumentation ranges from guitar to upright piano to Theremin to marching drum. Allow Alialujah Choir to sing their stories in ethereal allure.